Mary Pratt has always painted. 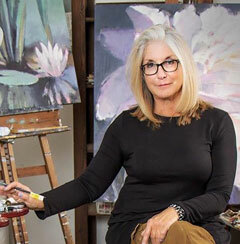 After graduating from Brenau University with a Bachelor of Fine Arts she has been actively involved in many faces of the art world; teaching painting theory, working with children gifted in the arts and with interior designers in planning nuanced interior spaces. Mary is known for her impressionistic, modern oil paintings inspired by a wide range of sources, including the scenery of her native state, Georgia. She uses a soft, ethereal palette with an occasional pop of color in her compositions to cultivate an imaginative visual experience.